Yet examined more closely, Allen making a TV show isn’t such a dramatic turn. He got his professional start as a gag writer and worked on a variety of TV shows in the 1950s and 1960s. He also directed a TV movie in 1994. That movie, Don’t Drink The Water, was based on one of his plays, which he has continued to occasionally, alongside prose pieces, even as his focus shifted to films. Crisis In Six Scenes may arrive as a six-episode TV series released exclusively streaming on Amazon, but it plays more like an elongated movie and its title sounds more like a play. It wouldn’t be a surprise if it turned out to be a reworked theatrical script from his proverbial bottom drawer. Or maybe middle drawer: Crisis In Six Scenes isn’t bottom-drawer Allen, even though he stars in it, which later in his career has often become a warning sign. Movies like The Curse Of The Jade Scorpion and Hollywood Ending have Woody spouting off one-liners, some funny and some creaky, but the movies themselves are flimsy, and weirdly overlong for a filmmaker who has made some bona fide classics that clock in under 90 minutes. 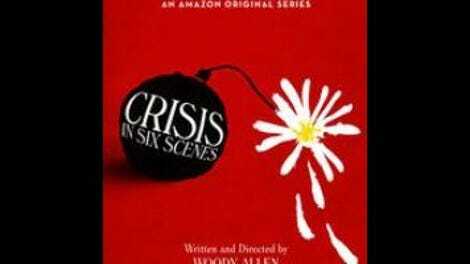 If Crisis In Six Scenes, with its six episodes of about twenty-two minutes in length (after subtracting credits), is essentially a Woody Allen movie supersized to run a bit over the two-hour mark, then it has the makings of one of his worst. And yet, to the extent that it can be judged against his features, Crisis is not one of his worst. Though it feels spare in terms of characters and Allen’s usual cast of luminaries – starring, instead of several recent Oscar nominees and It Girls, Allen, his old friend Elaine May, and Miley Cyrus – it also shows slivers of ambition in its first episode. It immediately sets itself apart from other Allen works from its opening credits, not because Allen has done away with his preferred credits font (he certainly has not), but because the song playing underneath isn’t an old standard or a jazz number, but a certified rock song: “Volunteers” by Jefferson Airplane. It’s also something of a cliché, announcing a show about ‘60s-set social turbulence with “Volunteers,” and that is indeed what Allen is doing. But as when his characters actually started carrying cell phones in the early ’00s, it still feels like a concession of sorts. Allen has made it clear that his preferred periods for period pieces are closer to his own childhood, setting movies in the ’30s and ’40s (like the recent Café Society), so seeing his show unfold during an unspecified ’60s, after the start of the Vietnam War but presumably before the Summer of Love, feels novel in a way that it wouldn’t for most other filmmakers or showrunners. Crisis In Six Scenes starts slowly, dedicating minutes on end to a conversation between Sidney J. Munsinger (Allen) and his feisty barber (Max Casella from Doogie Howser and, as it happens, Blue Jasmine) that establishes Sidney’s lot in life (he’s a writer, of course) and his Allen-ish aspirations slightly-to-very beyond his means, as he implores his barber to make his haircut look as close to James Dean’s as possible. It’s a funny scene, especially as the barber casually lays into Sidney’s most recent novel (characterizing it as the “ravings of a madman”) and, when Sidney mentions that he’s thinking of developing a television series next, reassures him that he shouldn’t feel bad “just because a TV series is considered lowbrow compared to a book.” It’s sometimes hard to tell how many levels latter-day Allen is attempting, satirically speaking – in this case whether, he’s simply being self-deprecating about doing television, or also winking at the way television has become so much more prestigious in the past half-century. Either way, though, it’s a funny scene, directed with Allen’s characteristic patience. Another funny bit, albeit somewhat thin, introduces Sidney’s wife Kay (Elaine May), a marriage counselor trying to help a couple played by Lewis Black and Becky Ann Baker, as they list the litany of ways that they differ in sensibility, opinion, and life choices, before arriving on common ground in their mutual dislike of guacamole. Then the show finally puts Sidney and Kay together, mostly for a round of exposition where they reveal that Alan (John Magaro), a young friend of the family, has been boarding with them. Really, this whole episode is exposition, padded out with some funny bits. Characters talk about how “polarized” the county has become (topical!) and Sidney is ominously compared to Job. The first episode finally ends on a low-stakes cliffhanger: There’s an intruder in Sidney and Kay’s house! Could it possibly be the third major star of the series who doesn’t actually appear in the first episode? It’s in the back half of the episode that Crisis In Six Scenes starts to creak – when those early, funny scenes give way to plot, set-up, and standard-issue Allen kvetching. Having already seen the second episode, I can say it confirms that these are barely episodes at all; they’re really just portions of a continuous whole. But again Allen’s old-fashioned approach can double as something new: Isn’t this how a lot of HBO series work, too? Hi, I’m Jesse, and I’m going to be with you for the full six-episode Crisis In Six Scenes run. 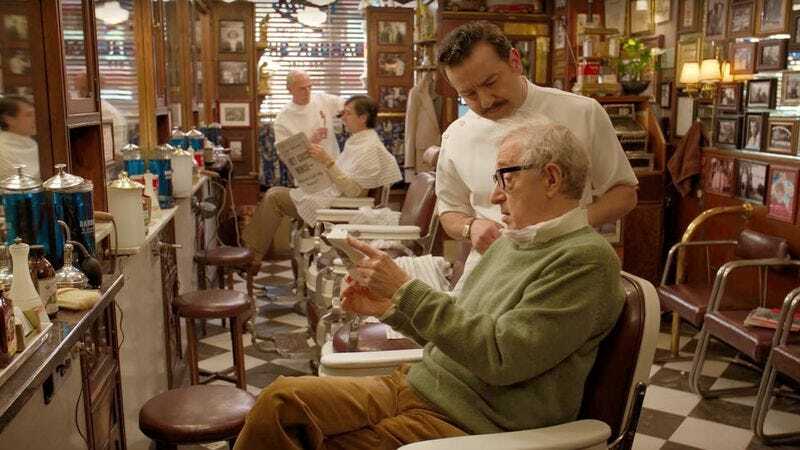 I review movies more often than TV, but that means I’ve seen a lot of Woody Allen pictures – not all of them, but almost. I think I’m currently missing three of his theatrical releases as a writer/director, which due to his sheer productivity means I’ve actually seen more movies by Woody Allen than by any other director. I won’t bore you with my favorites but I will say that as far as late-period Woody Allen goes, Scoop and Magic In The Moonlight are both underrated. I’m a sucker for a funny Woody Allen one-liner or turn of phrase, to such a degree that I’m not always sure how creaky they might be. I laughed at Sidney’s reference to writing an ad campaign for “orthopedic ice cream,” and even laughed at the line about him being “allergic to teargas,” despite the nagging feeling that he may have used that one before. I don’t think it was in any of his movies, but I haven’t combed through all of his prose to be sure it’s not in some New Yorker piece from 1965. Maybe it just sounds like it. Film-nerd points, or possibly just old-person points, for the running gag of Sidney prompting people to say his haircut looks like James Dean, and instead finding himself compared to relatively more homely character actors Franklin Pangborn and Percy Helton. As I mentioned last time I wrote about Woody Allen, it’s difficult to think about his work without considering the long-standing allegations of sexual abuse leveled against him. While I absolutely understand anyone not feeling comfortable watching his work anymore, I’ll be covering Crisis as any other TV series: with the assumption that anyone reading either is watching it, or is at least somewhat interested in watching it.